The City of Laguna Niguel Parks and Recreation Department provides a variety of recreation programs and opportunities for the residents of Laguna Niguel. The city’s aquatic center, which consisted of a 50-meter pool and an 18″ deep wading pool, was in need of major renovations. Counsilman-Hunsaker was retained by the city to renovate the wading pool and replace it with a 30’ x 60’ lesson pool that ranges in depth from 2’6” to 3’6”. Completed in 2011, the newly renovated Crown Valley Community Park Pool is an outdoor pool facility located in the middle of beautifulCrownValleyCommunityParkproviding incredible opportunities for citizens and visitors to celebrate health and community. 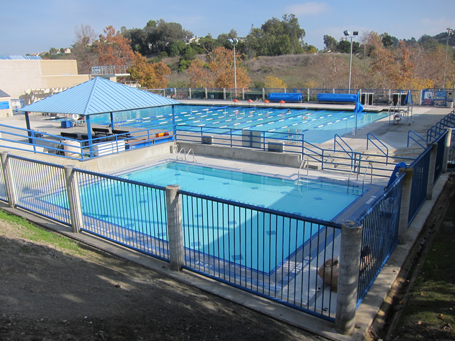 Not only does the outdoor pool make year-round swim lessons and lap swimming a reality in Laguna Niguel, but the well-attended facility also offers many unique programs such as Pain Management Therapeutic Aqua Exercise, and Power Water Workout. It is also home to the Crown Valley Diving Team and the Dolphin Aquatics.